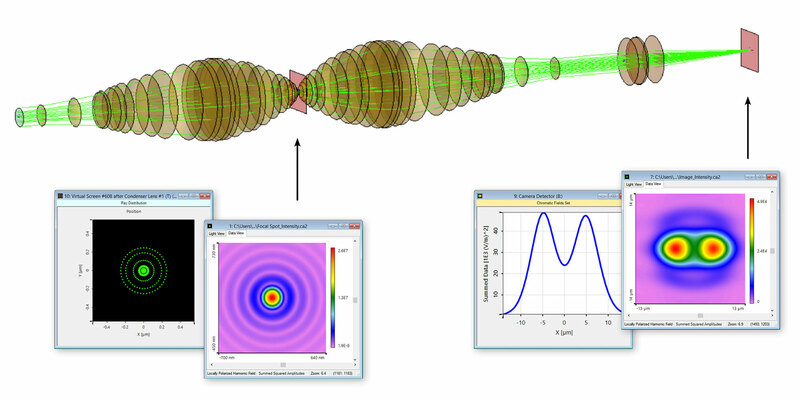 VirtualLab Fusion combines the best of different optical modeling approaches. Build up your optical system only once and three co-operating engines are at your service! Physical optics modeling often as fast as ray tracing. Automatic modeling selection enables physical optics modeling as easy as the application of ray tracing. Easy switching between ray tracing and physical optics modeling. Inclusion of Maxwell solvers for gratings, diffractive lenses and HOEs on planar and curved surfaces. Full flexibility of non-sequential modeling configuration including all or a customized selection of surfaces and gratings orders. Design of diffractive lenses with fabrication data export. Switching between sequential and non-sequential modeling forth and back in the same system setup. Sophisticated source models including lasers, laser diodes with astigmatism, VCSELs, LEDs, partially coherent, fs pulse and x-ray sources. Unsurpassed flexibility to define detector functions including energy quantities, polarization, coherence, spatiotemporal fs pulse quantities, amplitude and phase, dot diagrams, wavefront error, and aberrations. Integration of customized sources, surfaces, media, detectors and user-defined physical models in ray tracing and physical optics without mentionable reduction of modeling performance.